One of the best things with electric scooters is that the prices vary by a lot. This means that anyone with a few extra bucks in their pocket can own an electric scooter. The cheaper models might not have the best speed, distance per charge, or features but at least there is something for everyone. In this article, we will teach you what makes up the price of an electric scooter, and what shouldn’t make up the price. If you want to have a look at prices you should check out our electric scooter comparison. 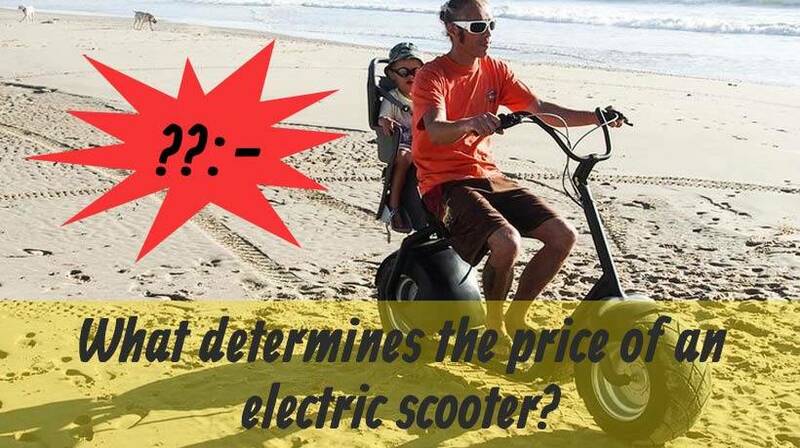 What determines the price of an electric scooter? While everyone hopes that price is a reflection of what you get. This is not always the case. I like to take SwagTron, former Swagway as an example. You who read my recommendations, guides and tips before, know that I have my own store in Sweden. Hence, I have first-hand knowledge of the pricing and producing of great quality electric rideables. Swagtron’s electric scooter is in my eyes way overpriced. I want to be clear that I love the brand for what they have made with their hoverboards and the community as a whole. Being early adopters they pushed the boundaries of how a hoverboard should be in order to keep buyers safe. With electric scooters, there were no boundaries pushed. Their scooter models are highly priced, does not have a lot of features, nor good specifics. They succeeded in selling it mainly because of their brand name was printed on the handlebar. This is where pricing goes wrong. Some products might even be cheaper but have far better performance and this is because there are no general rules about pricing. The brand sets the price and you either buy it or don’t. These above are all things you should take into consideration when buying an electric scooter. If you want high speed and long distance per charge you better pay for it. In terms of quality we mentioned the Swagtron above, this doesn’t always go hand in hand and that is where we come in to play. We create our reviews to highlight the strengths and weaknesses of each model in order for you to then be able to determine if the product is worth your hard earned cash or not. Generally, a more expensive scooter should provide higher quality, more comfortable riding, and better riding capabilities. As said numerous times already this isn’t always the case, but most of the times it is pretty accurate. A cheap electric scooter would be Razor’s electric scooters which still uses cheaper lead-acid batteries and make their models mainly out of steel which is heavier and far less expensive than high grade A aluminum. It has decent riding distances, moderate speed, a very long recharge time, and are heavy units to carry around. Therefore it is priced after those specifications. An expensive electric scooter would be the Qiewa Q1 which boasts an 800W motor, 26ah lithium-ion battery. This scooter takes you up to 62 miles on a single charge at 34 mph which is close to insane specifics for an electric scooter. There are faster ones out there but those cost anywhere around $2000-$4000 and this one is priced just below $1500. Comparing this one to the Razor scooter wouldn’t be fair. Razor’s products are built for children and the Qiewa Q1 is something I would never let my kids ride on. At least not on their own. Those are better for adults serious about riding electric scooters. So what smart things can we draw from this that might help you determine a scooters value, or any other electric rideable products for that matter? Will the scooter solve your problem or is it just for fun? How much would these problems be worth solving? Think long term, how much money would you save in a year or two? Do you fully understand your need for a scooter? Does the price of your preferred scooter reflect what you get? So now you know what should determine the price. Remember to also consider the price for a brand. Some unbranded scooters might not have that good of a warranty, nor have support state-side. Known, well-established brands have great support and warranty. Paying a few extra bucks to get those two very important things might not be such a dumb idea. You should now be able to narrow your choices down and find a nice affordable scooter that’ll aid you for years to come. If you want some suggestions we’ve made a comparison list on the cheapest models right now. ■Motor Power:800 Watts with 26Ah 48Volts 5C powered lithium battery. ■Max Drive Distance:100KM ■Dual shock absorber perfect for 45 design up to 1 million times the compression rebound. ■Max Drive Speed:55KPH■２Second Quick-Folding ■10 inches pneumatic tire and insulation design. Razor Power Core E90 Review - How good is the Razor PC E90 really? Gotrax Glider Review - Lightweight, cheap and good? Why will you buy an expensive scooter just because it’s faster? There is a speed limit so driving it fast will be prohibited. It would be a rare case if you only got a bit more speed if you went with the expensive ones. Most have other features and increased comfort, not to talk about distance per charge (which is in my opinion more important than speed).